Counter-attacking, complete Tottenham, controversial officiating and the handball rule feature in Mark Holmes’ review of the weekend action. There were six away wins in the Premier League over the weekend. Of those six, only Liverpool (61%) and Tottenham (54%) enjoyed more possession than their opponents, with Stoke City (34%), Watford (46%), West Brom (24%) and Southampton (46%) all winning despite seeing less of the ball. It was a similar story for Sunderland (34%), while Claudio Ranieri argued Leicester City would have won at Arsenal had they not lost Danny Simpson to two bookings. The Foxes led at half-time having barely given away a chance despite having only 33% of possession. It’s been the story of the season. Half of the teams in the Premier League have now won at least as many games on the road as they have at home, with Leicester, Liverpool, Crystal Palace and Bournemouth all picking up more victories away from HQ. Brendan Rodgers once famously said that dominating the ball gave a team a 79 per cent chance of winning the game, but even if that were once true, it certainly is not now. Manchester United top the possession league yet look long shots to make the Champions League, while Leicester are third from bottom of the possession league yet top of the one that matters. There are, in my opinion, several reasons for this. The first is that the quality at the top of the league has decreased. It didn’t matter how many players sat back to defend against Manchester United in the days of Cristiano Ronaldo, Carlos Tevez and co – eventually, someone would inevitably produce a moment of brilliance to find a way through. On Saturday United had Jesse Lingard providing their right-sided creativity. That is meant with no disrespect to a player that has at times impressed more than some of his better-known team-mates, but he is hardly Ronaldo. It is a similar story across the league. Gareth Bale and Luis Suarez have also moved on, as have Frank Lampard, Steven Gerrard and Robin van Persie towards the end of their careers. Teams like Sunderland are now backing themselves – and succeeding – to keep the traditional elite at bay on a regular basis. The other obvious change to the Premier League over the past couple of seasons has been the dramatic increase in quality of the mid-table clubs’ squads. As Jose Mourinho pointed out in the summer, the gap between the top six clubs and the rest has been significantly cut. It is best proven, of course, by the exploits of Leicester but also of the players now fielded by the likes of West Ham, Crystal Palace and Stoke City. That means teams like Stoke are being shown the same respect as only a handful of clubs would have been previously. Opponents are defending deep, and because Xherdan Shaqiri, Bojan and co are also below that top bracket of player, often they are succeeding in winning games in which they have been dominated. 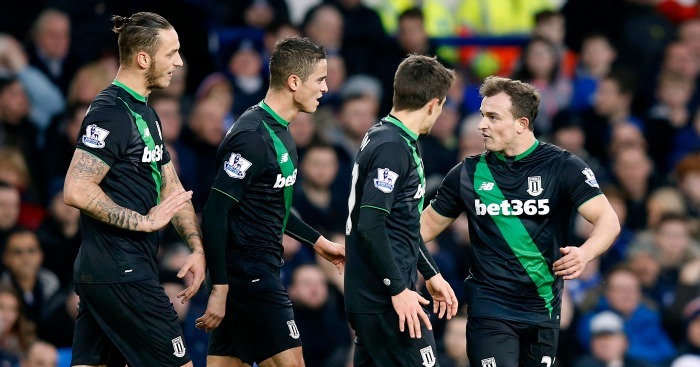 In fact, Stoke have had more possession in seven of the 10 games they have lost in the Premier League this season. Of the 10 they have won, they had more possession in only one – and that was against 10 men. It’s a remarkable statistic which highlights how irrelevant possession statistics have become. In no way can they be used as a means of proving a side’s dominance in a game. Games are now being won through long periods of possession but through effective pressing and then quick, incisive breakaways. Leicester’s counter-attacking has been a joy to watch all season, but it will be interesting to see how they fare in the final third of the season against teams that will surely now defend deep and in numbers. One side capable of dealing with any opposition approach, however, is Tottenham. I wrote about them in detail here, but Mauricio Pochettino has found the perfect balance between possession – Spurs kept the ball at Manchester City on Sunday as a defensive tactic, to stop the hosts from building any momentum – and quick counters, perfectly highlighted by Christian Eriksen’s winner at the Etihad Stadium at a time when many other teams would have looked to hold on for a point. There are still four sides, including City, capable of winning the title this season, but Spurs look – to this neutral at least – as the most complete at this moment in time. They will need to be more ruthless in front of goal over these last 12 games, but it really will take an outstanding manager to exploit any chinks in their armour because currently there just don’t appear to be any. On a day that truly warranted the ‘Super Sunday’ tag, surely nobody associated with football could feel anything other than immense sadness and disappointment that all the debate since those two huge games has been spent bemoaning the performance of the officials. Martin Atkinson’s display in Arsenal’s dramatic win over Leicester City certainly added weight to the school of thought that bad refereeing decisions add to the drama of football, but it can’t possibly be right that Atkinson – or any other one official – can have such a major impact on a game of such magnitude in a league awash with money. Everyone has their own opinions on how much more – if any – technology should be introduced to help referees, but it simply does not make sense that a league can sell rights to screen its games for £5.136billion yet regularly leave fans feeling short-changed by the mistakes of the man in the middle. Whatever additional help they are eventually given – and it is surely only a matter of time of ‘when’ rather than ‘if’ – can only be a good thing. There were so many contentious calls at Emirates Stadium on Sunday that both sets of supporters will claim their team was hard done by. 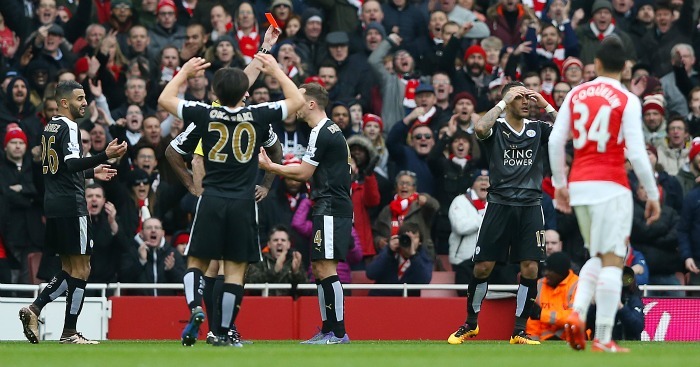 Arsenal had complaints about Leicester’s penalty, could have had one themselves and can argue with some justification that Danny Drinkwater should have been sent off for a nasty challenge on Aaron Ramsey, but it was the Foxes that suffered from the real game-changing decision when Danny Simpson was shown two yellow cards in quick succession. Arsenal fans have suggested Simpson should have been booked earlier, but the facts are that Simpson had only been penalised for one foul when he was shown a somewhat harsh yellow card for getting in the way of Alexis Sanchez. Criticism should perhaps be reserved for Simpson for giving Atkinson a decision to make when making another foul five minutes later, but it was hard not to sympathise with Claudio Ranieri’s view when pointing out the difference in the severity of the foul committed by Aaron Ramsey in the first half and the two later committed by Simpson. 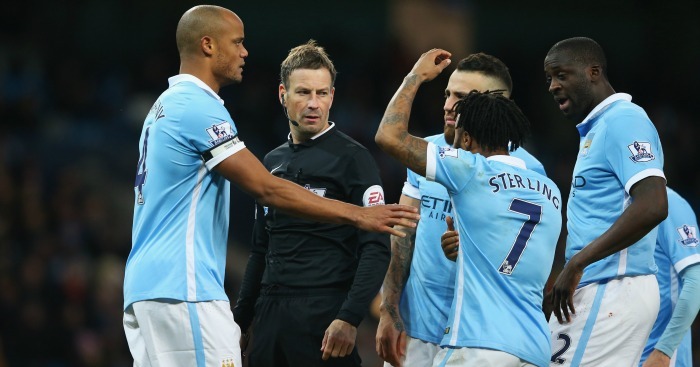 It is not right that a late tackle not quite forceful enough to be a red card can be penalised in the same way as a shirt pull in the middle of the pitch – orange cards have been suggested before, but the real issue is that referees have been gradually coerced over the years into showing more yellow cards for minor offences, leading to lots of inconsistency. It was hard not to wonder whether Atkinson would have treated an Arsenal player as harshly as Simpson – and it was even harder not to think of Simpson when Yaya Toure escaped punishments for several fouls in the later game at the Etihad Stadium. Whatever your verdict on which side was most wronged by Atkinson – Leicester felt they should have had another penalty before Simpson’s red card – surely nobody can argue it would have been to the benefit of all were the major decisions reviewed by another official aided by replays. The above statement was certainly true of the game between Manchester City and Tottenham, with Raheem Sterling punished for a cross which may, possibly, perhaps, have touched the underside of his arm as he turned his back to block a cross. It is hard to say even now, after countless replays, whether the ball did in fact touch Sterling’s arm, but what is certain is that the England winger did not intend to use his arm and did not have it in an unnatural position. Some will say Sterling took a risk in turning his back, but that is just a cliche – a ball can just as easily hit the arm of a defender facing a cross, as we witness on a regular basis. Clearly, though, the rules regarding handballs need clarifying because currently they seem to be far too open to a referee’s interpretation, leading to arguments on a weekly basis which nobody is able to win. Nobody knows what is and isn’t handball any more. Some say that, to avoid confusion, every handball should be penalised, but here’s a radical idea: how about actually applying the current rule and only penalising deliberate handballs? Forget about arms in ‘unnatural’ positions, where the ball has come from and where it is heading. Just let the referees make one simple decision: did the defending player mean to handle the ball? There’d be a lot less penalty kicks awarded – and when you see incidents like Sunday’s, can anyone argue that wouldn’t be a good thing?